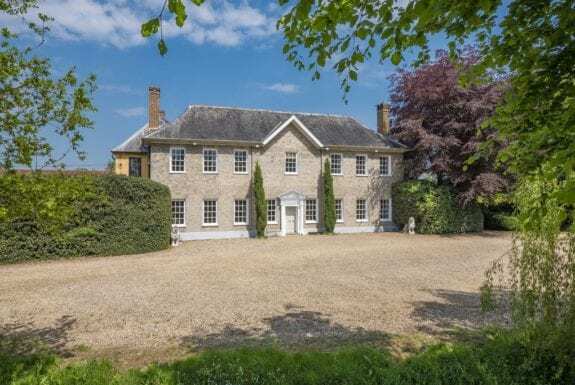 This substantial former Rectory occupies a prominent position in the heart of one of Suffolk's most highly regarded villages. The property requires a degree of updating/decorative attention but nonetheless retains much of its original character with the benefit of a separate coach house/annexe and charming established gardens. In all about 0.43 acres. ENTRANCE HALL: (9.5m x 2.74m) 31'2" x 9' A spacious area with a black and white tiled floor running throughout and in part, a 21ft high ceiling with an elegant staircase rising to the first floor. 9ft arched sash window deep skirting and cornicing. DRAWING ROOM: (5.94m x 4.93m) 19'6" x 16'2" Enjoying a view of the pretty street scene through three 8ft sash windows complete with original shutters. 10'6" ceiling height, ornate cornicing and fireplace with marble surround. French doors open onto terracing and the garden beyond. DINING ROOM: (5.87m x 4.9m) 19'3" x 16'1" Three 8' sash windows provide good natural light and are finished with original shutters. 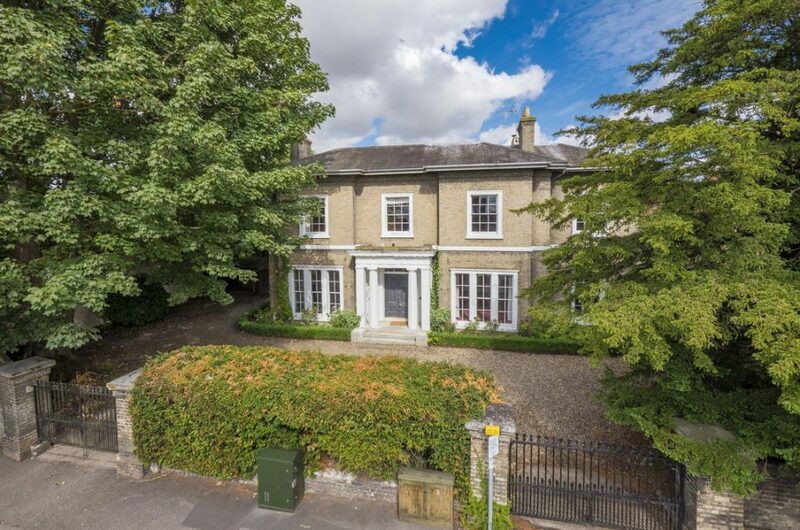 There is recessed shelving, cornicing, picture rail, deep skirting and a fireplace with marble surround, brick hearth and inset multi-fuel stove. SITTING ROOM: (3.84m x 3.81) 12'7" x 12'6" A versatile space that could be an office, playroom etc. Large sash window, folding shutters, deep skirting and shelving. KITCHEN (2): (4.01m x 3.43m) 13'2" x 11'3" With a large sash window and a fireplace with inset original cast iron range. There is a marble topped work surface, space/point for a gas Range, worktop incorporating a butler sink and plumbing for dishwasher. UTILITY AREA: (4.27m x 1.17m) 14' x 3'10" Plumbing for washing machine and space for tumble dryer, full height fridge-freezer etc. SHOWER ROOM: With a distinct shower area, WC and wash hand basin. CELLAR (2): (5.51m x 2.69m) 18'1" x 8'10" With fitted wine bins. CELLAR (3): (3.81m x 3.68m) 12'6" x 12'1"
GALLERIED LANDING: With a view over the garden and the entrance hall below. Useful linen cupboard and openings to inner landings. BEDROOM 1: (4.67m x 4.09m) 15'4" x 13'5" With a high ceiling, pretty Georgian fireplace and sash window. En-suite: Fully tiled shower cubicle, WC and wash hand basin. En-suite: (Also accessed via the landing) A large sash window provides views over the garden, suite including a large shower cubicle, WC and wash hand basin. BEDROOM 3: (5.38m x 4.11m) 17'8" x 13'6" A large sash window provides a pretty roofscape view, useful storage cupboards, high ceiling, deep skirting and fireplace with inset Georgian grate. BEDROOM 4: (3.91m x 3.78m) 12'10" x 12'5" Large sash window, high ceiling and deep skirting. BEDROOM 5: (4.29m x 3.81m) 14'1" x 12'6" Sash window, useful storage cupboard, deep skirting and fireplace with an inset ornate Georgian grate. BEDROOM 6: (3.35m x 3.3m) 11' x 10'10" A sash window provides a wonderful view over the tower and street scene below. BATHROOM (4.52m x 3.25m) 14'10" x 10'8" Part panelled walls, exposed floorboards, fireplace and roll top ball and claw foot bath. Sash window and large enamel wash hand basin. SHOWER ROOM: Fully tiled shower cubicle, WC and wash hand basin. BEDROOM 7: (5.44m x 4.42m) 17'10" x 14'6" With field views. BEDROOM 8: (4.75m x 2.44m) 15'7" x 8' Useful recessed area with fitting hanging rails. RECEPTION HALL: (4.47m x 2.39m) 14'8" x 7'10" With a 14ft high ceiling, tiled floor and double doors opening onto terracing and the garden beyond. Log burning stove and useful cloaks cupboard. Inner Hall: With a brick floor, staircase to second floor and useful storage cupboard. En-suite: Including deep double ended bath with shower attachment over, heated towel rail, WC and wash hand basin with storage below. BEDROOM 2: (4.45m x 2.21m) 14'7" x 7'3" A versatile room with a high ceiling and a sash window. BEDROOM 3: (7.34m x 4.14m) 7'5" x 7'3" A modest yet versatile space that could be an office, playroom etc. SHOWER ROOM: Fully tiled shower cubicle, WC and wash hand basin with storage below. KITCHEN: (4.01m x 2.24m) 13'2" x 7'4" Fitted with a range of matching units and worktops incorporating a single drainer sink unit, vegetable drainer and mixer tap over. Space for appliances and integrated electric oven with 4 ring hob and extractor fan over. Utility cupboard: Plumbing for washing machine and space for tumble dryer. Outside Twin brick pillared entrances with handmade wrought iron gates open to a sweeping semi-circular drive providing extensive parking for several vehicles. There are two specimen trees, raised beds, hedging, double gates provide access to the rear garden and there is ample space to erect a DOUBLE GARAGE/CART LODGE (subject to the necessary planning consents). 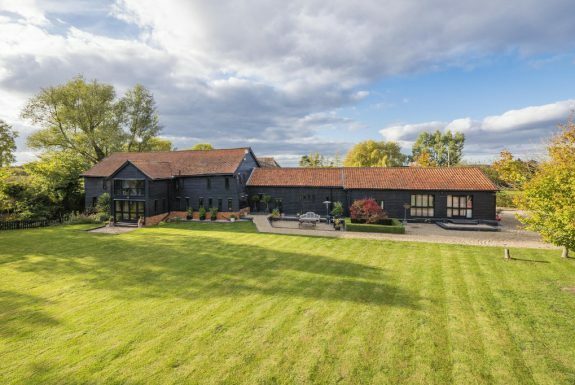 The garden is one of the property's most attractive features, generous in size with separate vehicular access for The Coach House which in turn has its own area of garden if required. The main garden includes well-placed terraces, expanses of lawn and stocked beds filled with colour and variety. In all about 0.43 acres. A number of specimen trees are subject to Tree Preservation Orders. The property has the benefit of a security alarm system. The measurements contained within these particulars are intended as a guide only and should not be relied upon as entirely correct.